Admitting and understanding pay gaps is not easy for societies nor employers. A comprehensive pay gap analysis in the UK revealed inequalities for women and men, for ethnic groups and for people with a disability. Related recommendations go beyond traditional ways to address gender pay gaps, and they question wide-spread communication styles in the field. While for some, D&I still feels like a new (ad)venture, others have already witnessed 20+ years of development in the field. One of the leading D&I magazines presents ten critical expert analyses including learnings and recommendations. The family-owned Prettl Group with almost 10,000 employees sucessfully runs five business unit, Automotive, Appliance Solutions, Electronics, Energy and ProSys. The current company magazine focuses on Diversity & Inclusion. The expert interview with Michael Stuber can be found here. ENEL’s current issue of their corporate magazine is dedicated to how to create value for business by fostering diversity inside corporations. The company describes itself as a laboratory of diversity. Der klassischen Frauenförderung haftet der Beigeschmack der umgekehrten Bevorzugung an. Dessen ungeachtet fördert das AMS Österreich die technische Ausbildung – und neustens auch ein FH Studium; und zwar mit Quote und umfassend. Das RKW Kompetenzzentrum, der Verband binationaler Familien und Partnerschaften und International HuMan Power haben gemeinsam eine Argumentationshilfe zum Umgang mit diskriminierenden Vorurteilen gegenüber Zugewanderten im Betrieb veröffentlicht. Two recent studies show that culture tends to be underestimated as a success factor in large companies and that the leadership style (of at least the CEO) should be different from the existing organisational culture. The combination of the findings reconfirms the business case for a need to tackle Diversity, Culture and Leadership in a comprehensive way. Die Arbeitgeber-Bewertungsplattform kununu hat mit verschiedenen Partnern in Österreich und Deutschland familienfreundliche Arbeitgeber ermittelt. Eine Rangliste basiert auf abgegebenen Bewertungen, die andere auf einer Befragung von über 10.000 ArbeitnehmerInnen. Is Diversity naturally embedded in Project Management or does this new and hugely complex profession needs to reconsider the way it is looking at differences? 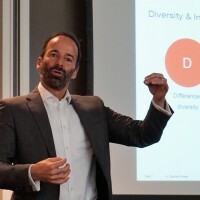 A keynote at the (Gender) Diversity in Project Management Congress in the Netherlands set the scene.